Whatever the reason, the Navy was left to salvage something from J-UCAS. They renamed the program, first to N-UCAS for Naval then to UCAS-D for Demonstration. And they announced their intention to keep both industry teams in the running. Its taken an entire year for the Navy to piece UCAS-D together; the request for proposals is due any day now. But whether it will eventually produce a real live combat aircraft is anybodys guess. Technological hurdles are few but cultural, fiscal and organizational obstacles abound. Sources inside the Boeing X-45 program say that the office has been effectively split in two, with some staff still surviving on remaining J-UCAS funds and others spending company money while awaiting the Navy contract. Problem is, these two camps are prohibited from working together, for political reasons. And those residing the viable Navy half of the office are apparently being rather mismanaged encouraged to do advanced work on X-45 despite the contract and prospects for government money being some months away. Thats risky, especially in light of the tenuous health of Boeings other drone programs, which have been stripped of people and money in order to keep UCAS-D going. No word on whether Northrop Grumman is suffering similar in-fighting. Probably not, considering that X-47 has long been Navy-optimized and also bearing in mind the firms tremendous success with the RQ-4 Global Hawk drone. After a bullish decade, aerial drones are getting a reality check. 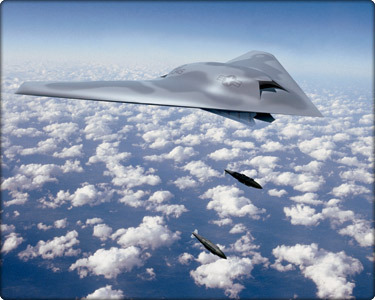 The Pentagon has cast its lot with manned fighters over UCAVs and the Army is cutting in half its portfolio of future airborne drones in order to save cash; meanwhile, the Air Force seems to prefer a manned bomber for the Long-Range Strike mission. But if the Navy stands by UCAS-D, drones future just might turn around.